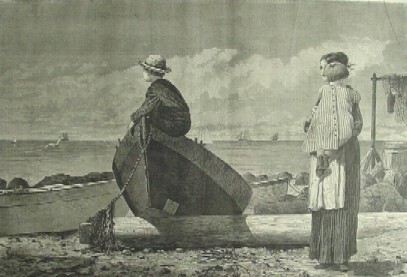 Below are pictures and links to our inventory of Winslow Homer wood engravings. 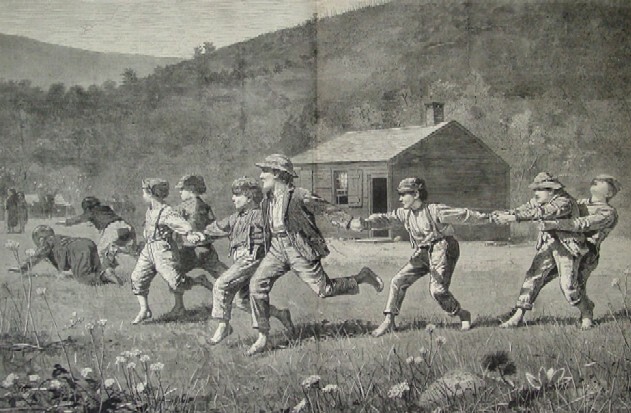 Most of these were published in Harper's Weekly where Homer worked as a free lance illustrator between 1857 and 1876 before his career as a painter was fully launched. 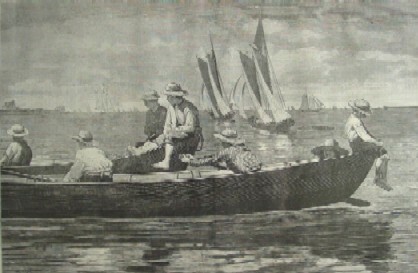 Some of his best engravings were also published in the now forgotten publication Every Saturday. His watercolors and oils now sell for millions of dollars and are mostly in museums. 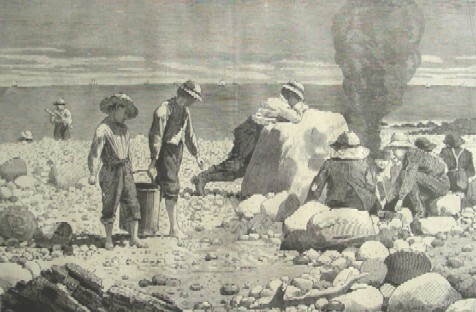 The author of books on Winslow Homer's paintings at Prout's Neck ("Winslow Homer in the 1890's: Prout's Neck Observed") and his wood engravings ("Winslow Homer's Magazine Engravings"), Philip C. Beam, notes that Homer was the "leading designer of wood engravings of his day, and that many of the engravings are now loved and admired as masterpieces of their kind" and that "At their best they rank with his watercolors and oils for style and beauty." had his finger on the pulse of American life and his eye on the American scene in an unexcelled fashion during a vibrant and important time in our national life, the years just before and after the Civil War...For insights into what people felt and did on street corners, in parks, on battlefields, or in backyards, as the times moved along, there are few better sources of our visible history. That is one of the reasons these prints have found their place in the History Gallery. 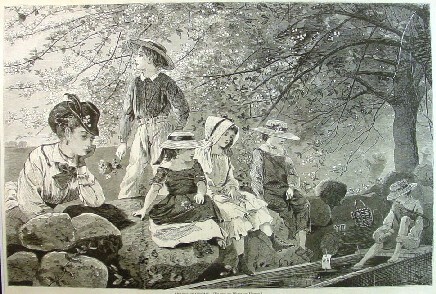 Another is that they are lovely engravings many of which capture the bucolic ambiance of bygone days and are relaxing and pleasing to contemplate. 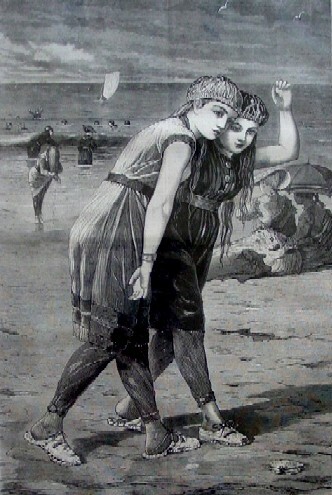 This web page and the next page provide examples of Homer's original genre wood engravings from Harper's Weekly and the third page contains Homer's rare 1870 and 1871 engravings from Every Saturday. 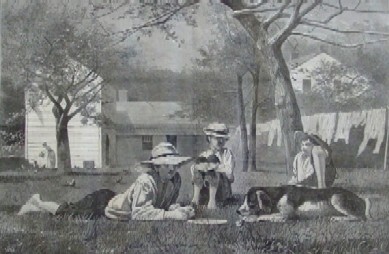 The final page contains his Civil War engravings from the battle and home fronts. 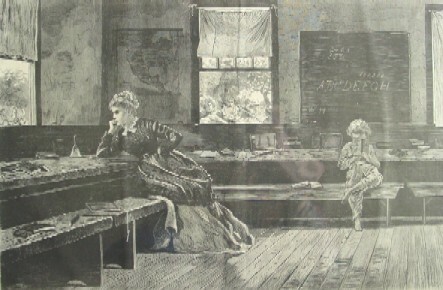 A few of the engravings have been framed, as shown below, and most of the remainder have been matted to standard frame size (16 x 20 inches or 11 x 14 inches) so they can be easily and inexpensively framed, and are protected by protective plastic sleeves. 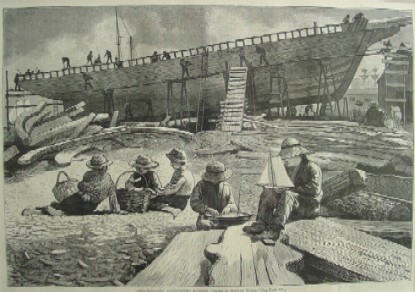 Click on the pictures or titles of the wood engravings and it will take you to a page with greater details and price. 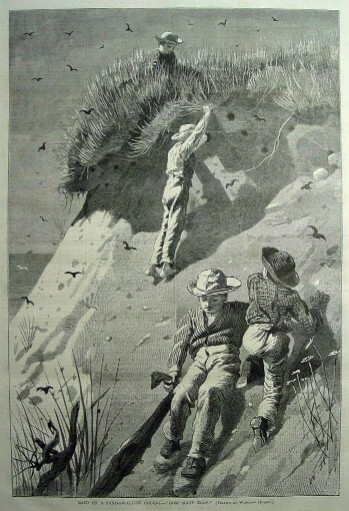 Winslow Homer's Famous Double Page "Snap-the-Whip"
Raid On A Sand-Swallow Colony -"How Many Eggs?"